It’s been a long time since I read something I could not bear to put down. Quick, easy-to-read chapters with just enough detail for your mind to fill in the blanks, the small-town murder mystery in Moose River pulls you right along. Amusing and completely believable, especially if you’ve ever lived in a small town in Minnesota. 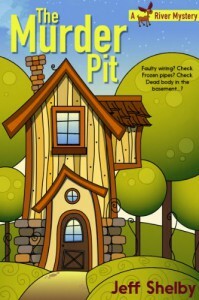 If I ever go old house-hunting, there are a few extra items I’ll be checking out, just to make sure I don’t buy my own Murder Pit.